KEARNEY – When he was a freshman, Odwuar Quiñonez’s adviser told him to cut down on the extracurricular activities. He was active with seven different organizations, spent 20-plus hours a week preparing for theater productions and took a full class load. His adviser was worried he might get burned out. “A lot of my friends would tell me the same thing,” said Quiñonez, now a senior at the University of Nebraska at Kearney. He didn’t share their concerns. Quiñonez was having fun, meeting lots of new people and diving headfirst into his new life as a college student. That drive was developed at a young age. Quiñonez, the son of immigrants from El Salvador and Guatemala, didn’t have the easiest childhood. A month after he was born in Lexington in 1997, his family moved to Guatemala, where Quiñonez lived for a decade. His parents, neither of whom finished high school, sent him to the United States a couple of times to stay with family members and start learning English. “They wanted a better future for me,” said Quiñonez, who returned to Lexington with his father at age 10 and bounced between four different communities over the next five years. When his mother and younger sister relocated to Lexington during his sophomore year of high school, Quiñonez moved in with them and was finally able to settle down. Quiñonez was always a strong student, earning mostly A’s and B’s, but he took his education to a new level at Lexington Public Schools. He got involved with speech, one-act plays and student council, and he started chess and sign language clubs as a senior. Quiñonez was also part of the National Network for Educational Renewal. Through that program, a group of students working with the Lexington Community Foundation and Lexington Public Schools Board of Education collected donations, organized fundraisers and secured grant funding to purchase, renovate and reopen the Majestic Theatre, which closed in 2009. The downtown Lexington theater reopened as a nonprofit, volunteer-run facility in 2015, the same year as its 100th anniversary. This determination also helped Quiñonez accomplish a bigger goal – attending college. “I had my motivation, which was my mom, because she was always pushing me to do great things in life,” he said. However, he knew finances would be an obstacle. As a Thompson Scholar, he received a Susan Thompson Buffett Foundation Scholarship. When he was awarded a $40,000 scholarship from the Peter Kiewit Foundation, he couldn’t control his emotions. “I started crying from the excitement,” Quiñonez said. He planned to take full advantage of the opportunity, arriving on campus determined to make an impact. 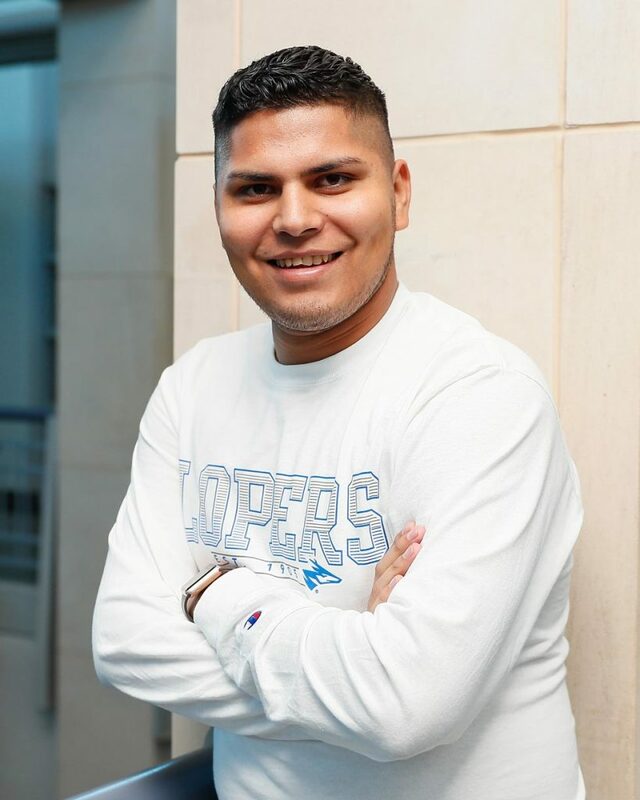 Quiñonez joined Phi Delta Theta as a freshman and has served as the fraternity’s secretary and philanthropy chair, helping launch an annual fish fry that supports The LiveLikeLou Foundation, a national organization that raises money and awareness for amyotrophic lateral sclerosis (ALS), also known as Lou Gehrig’s disease. During the fall semester, the UNK fraternity teams up with KneeKnocker Woods, a Halloween attraction near Gibbon, to raise money for ALS organizations. Quiñonez said his involvement with Greek life has helped him grow as a person, leader and communicator. The UNK senior has been active with the Office of Multicultural Affairs (OMA) through organizations such as the Hispanic Student Association, Sister to Sister and Collegiate Leadership Development Program, as well as the annual Nebraska Cultural Unity Conference. “I try to give back to them because they’re the ones who believed in me and they’re the ones who gave me this huge opportunity and are making my dreams come true,” he said of OMA. His involvement also includes the Phi Eta Sigma, Kappa Delta Pi and Chi Alpha Epsilon honor societies, Order of Omega, Loper Leaders, The Arc of Buffalo County, The Big Event, TRIO, Thompson Scholars Learning Community, Loper Programming and Activities Council and New Student Enrollment. 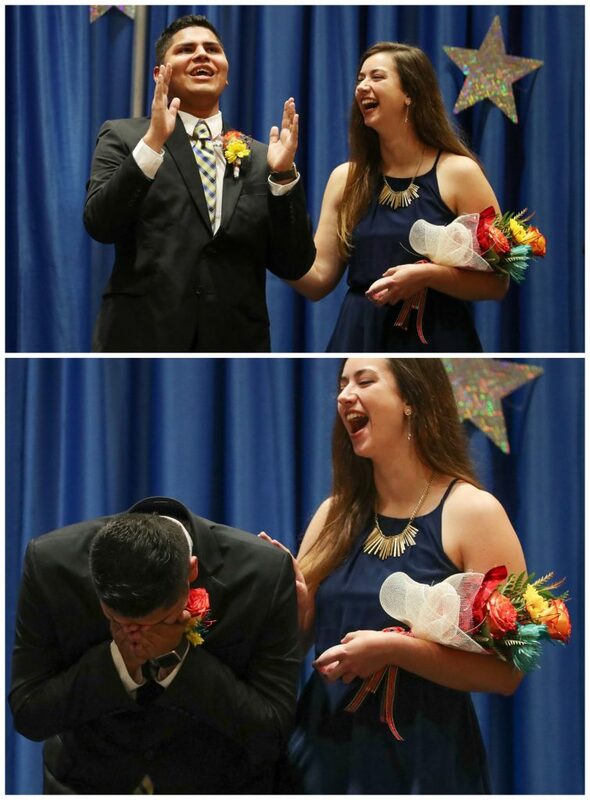 With a resume that long, it was hardly a surprise when Quiñonez was named UNK homecoming king during last month’s festivities – although there was one person who didn’t see the recognition coming. 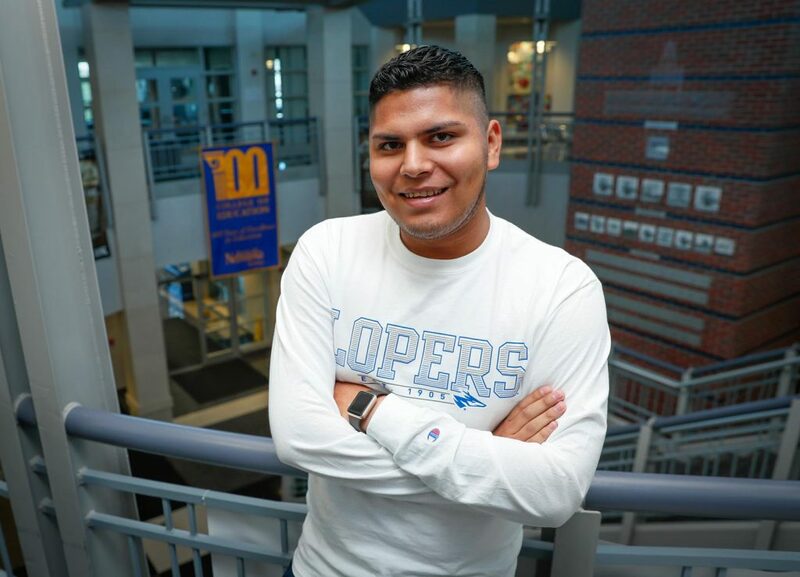 Quiñonez, who has made the dean’s list every semester, hopes he inspires other minority students to do great things at UNK. The elementary education major calls teaching one of his passions – “I want to make a difference in students’ lives,” he said – but there’s another goal he still has his eyes on.